A heart patient’s own skin cells could soon be used to repair damaged cardiac tissue, thanks to the pioneering stem cell research of the University of Houston’s newest biomedical scientist. Robert Schwartz’s new technique for reprogramming human skin cells puts him at the forefront of a revolution in medicine that could one day yield miracle treatments for Alzheimer’s, diabetes, muscular dystrophy and many other diseases. In December, Schwartz brought his ground-breaking research to UH as the Cullen Distinguished Professor of Biology and Biochemistry and head of UH’s new Center for Gene Regulation and Molecular Therapeutics. He is also affiliated with the Texas Heart Institute (THI) at St. Luke Episcopal Hospital where he is director of stem cell engineering. His hiring was a major step in UH’s effort to become a world-class center for medical research, said John Bear, dean of UH’s College of Natural Sciences and Mathematics. 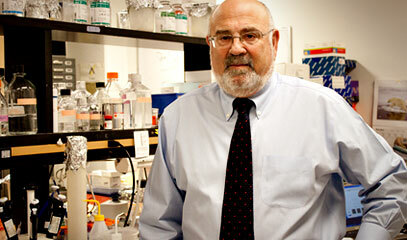 Last year, Schwartz devised a method for turning ordinary human skin cells into heart cells. First, the cells are treated with a type of virus and are transformed into induced pluripotent stem cells. These are similar to embryonic stem cells in that they could – in theory – be reprogrammed to become any other type of human cell – such as heart, brain, kidney, etc. This avoids the controversial practice of using human embryos. Schwartz then treated the cells with a second factor to make them cardiac progenitors, or early-stage heart cells. These progenitors – derived from a patient’s own skin cells – could then be implanted and grow into fully developed beating heart cells, reversing the damage caused by previous heart attacks. Survivors of heart attacks are left with dead cardiac tissue that weakens the heart’s ability to pump and can develop into scar tissue and cause arrhythmias. These new heart cells would replace the damaged cardiac tissue. This technique is in the process of being patented and early clinical trials in which these reprogrammed cells are implanted into heart patients could begin within one or two years, Schwartz said. Although Schwartz is not the first scientist to turn adult cells into induced pluripotent stem cells, his improved method could pave the way for breakthroughs in other diseases. In 2007 a Japanese scientist was the first to announce he had created these induced stem cells from skin cells. However, that technique required four factors and only about one percent of the treated cells converted into stem cells, Schwartz said. In Schwartz’s method, only one transcription factor is required and about 70 percent of the treated skin cells become stem cells. Armed with an effective way to make induced stem cells from a patient’s own skin, scientists can then begin the work of growing all kinds of human cells. For example, new neuronal cells could treat Alzheimer’s patients or those with severe brain trauma. Or a diabetic could get new insulin-producing cells in the pancreas. Or new kidney, lung or liver tissue to treat a variety of diseases. And one day, scientists could even grow an entirely new heart or other organ from these reprogrammed cells. “We’re trying to advance science in ways folks never even dreamed about,” Schwartz said. “The idea of having your own bag of stem cells that you can carry through life and use for tissue regeneration is at the very cutting edge of science,” Schwartz said. In addition to Schwartz’s heart research, he and his team are also working on turning induced stem cells into skeletal muscle cells to treat those with muscular dystrophy. The new research center Schwartz heads will be housed in state-of-the-art laboratory facilities at UH’s Science and Engineering Research Center. Three research faculty members are already at the center with Schwartz and another three will be added soon. Schwartz has decades of experience at the Texas Medical Center. Before coming to UH he was director of the Institute of Biosciences and Technology, a research component of the Texas A&M Health Science Center located in Houston’s Medical Center. He was also a long-time tenured professor at Baylor College of Medicine and co-directed the school’s Center for Cardiovascular Development. What attracted him to UH, Schwartz said, was the commitment of administrators and faculty to making the university a premier center for biomedical research. Schwartz’s hiring comes just a year after the arrival of Jan-Åke Gustafsson, a world-renowned scientist and cancer researcher. They join other leading UH faculty – ranging from biochemists to computer scientists to mathematicians – who are deeply involved in cutting-edge medical research.